a. The Virgo interferometer, near Cascina (Pisa). Its entry into operation on the 1st of August 2017 represented a turning point in observation capability of the network of interferometric detectors. For centuries, our understanding of the universe was based on the study of the electromagnetic radiation emitted by celestial objects. 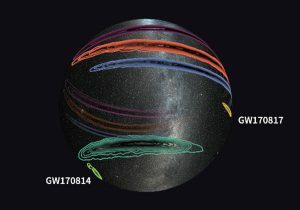 Thanks to the first direct detection of gravitational waves by the Ligo/Virgo collaboration on the 14th of September 2015, today a new perspective in observing the universe has been opened, complementary to electromagnetic observations, which avails itself of the messages carried by these tiny vibrations of spacetime. Most of electromagnetic waves are generated by excited molecules and atoms, whereas gravitational waves are emitted by collective movements of matter and, for this reason, have much larger wavelength than the waves composing the electromagnetic spectrum. Furthermore, electromagnetic radiation can easily be shielded, whereas the gravitational one interacts very weakly with matter. Whilst this property makes it extremely difficult to detect, it enables it to travel to us without being significantly mitigated by the matter encountered along its way. Therefore, gravitational waves carry information which are inaccessible to the electromagnetic ones. The first measurements of gravitational signals by the Ligo and Virgo interferometers allowed us to study black holes in binary systems. The information about the nature of the source and its fundamental parameters – in this case mass and spin – is indeed codified in the temporal evolution of the gravitational wave they emit. From the first detection until today, six coalescences of black hole binary systems have been observed, of whom five have been confirmed with great statistical significance (see fig. b). The masses of the binary systems detected by Ligo and Virgo, compared to the ones known thanks to electromagnetic observations, that are indicated by the coloured stripes. The body resulting from the fusion of the two neutron stars could be another neutron star immediately collapsed into a black hole. The masses of the progenitor black holes are around 40 times the mass of the Sun, typically more than twice compared to those previously known by observing the X radiation emitted by the matter orbiting around the celestial body. So, gravitational signals have highlighted a new family of black holes, raising new questions about the mechanism of their formation. The accurate knowledge of the waveform produced by these binary systems makes them exceptional laboratories for the verification of Einstein’s relativity in strong gravitational field and high-speed regimes (let’s consider, for example, that, in the moment of their collision, the two black holes of the first detection were moving at a relative speed equal to almost half the speed of light). From the measurement of the gravitational signal emitted it is also possible to derive the distance between the source and the Earth: the furthest binary system away from us we have observed so far was at about three billion light-years. Virgo’s entry into operation, on the 1st of August 2017, represented a turning point in observation capability of the network of interferometric detectors. By adding a third instrument, it is indeed possible to significantly improve the ability to locate the source in the sky. For example, in the case of the fusion of two black holes registered by Ligo and Virgo interferometers on the 14th of August 2017, the binary system was located within an area of around 60 square degrees, to be compared to the 1200 identified only by Ligo interferometers (see fig. c). In addition, with three interferometers it is also possible make an assessment of the “polarization states” of the wave (in other words, of its oscillation directions): according to general relativity there are two states, however other metric theories of gravity allow up to six. Therefore, gravitational waves can be an instrument to discriminate among the different theories of gravity. Uncertainty in the source regions of the gravitational waves detected by Ligo and Virgo. The coloured lines indicate the probabilities associated to the included area (90% for the outer line, 10% for the innermost one). The smaller areas, indicated by tags, refer to the two signals measured using all three interferometers (the two of Ligo and Virgo’s one): GW170814 is the signal coming from the black hole binary system, GW170817 is the one coming from the binary system of two neutron stars. The two events recorded by Ligo and Virgo show a margin of error which is more than 10 times lower than in the events recorded only by Ligo’s interferometers. The pointing capability was decisive in another event, recorded in August 2017 too. On the 17th, at 2.41 pm, Virgo and Ligo observed for the first time the collision between two neutron stars at 130 million light-years away and they managed to identify its position in the sky with a precision of about 30 square degrees. The gravitational signal was followed at a short distance (about 1,7 seconds) by a gamma-ray flash registered by Fermi and Integral satellites, so confirming the connection of these highly energetic events with the coalescence of neutron stars. The alert launched by Ligo and Virgo was received by dozens of telescopes that were pointed at the region of the sky involved and identified the host galaxy (NGC 4993); they have been monitoring the development of the electromagnetic emission in all spectral bands for several weeks. The binary system observed on the 17th of August was the first to produce an electromagnetic counterpart, thanks to the presence of neutron stars, and it was actually the birth of multi-messenger astronomy. It’s only the beginning of a great adventure. Ligo and Virgo will start measuring again in the first months of 2019. New signals will be detected, perhaps coming from sources not yet probed: mixed binary systems composed of black holes and neutron stars, single neutron stars in rapid rotation, supernovae. 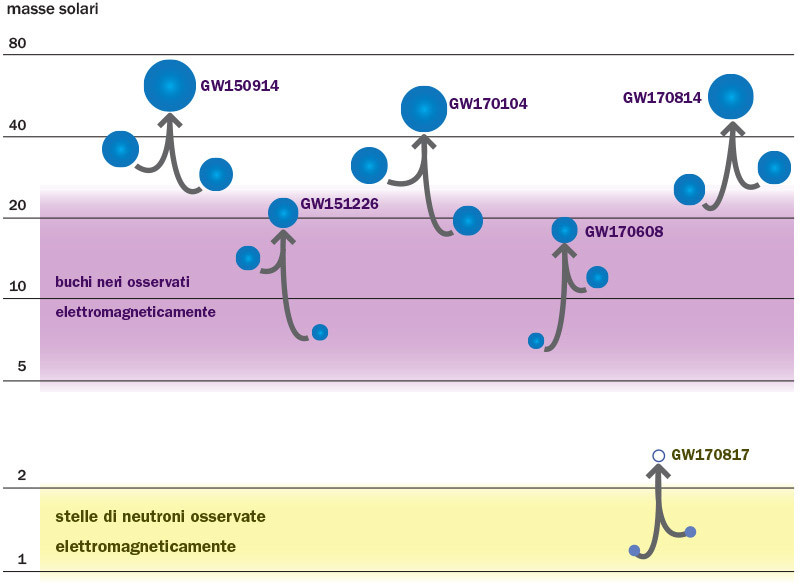 Some of these gravitational events could be accompanied not only by the electromagnetic radiation emission, but also by neutrinos, thus creating the conditions for new and more extensive multi-messenger observations. What about the further future? Improvement programs for the existing interferometers have already been set up, while, in parallel, international community is moving towards the third generation of ground-based interferometers. In Europe, the Einstein Telescope will lead to an improvement of sensitivity of about 10 times compared to the current detectors, opening the doors to gravitational astronomy of precision and to the detailed study of possible violations of Einstein’s gravity in strong field conditions. The ultimate expected result, inherent the elusive nature of this radiation, will be the observation of the “stochastic background” of gravitational waves, which will allow us to go back in time, to the very first moments after the Big Bang.